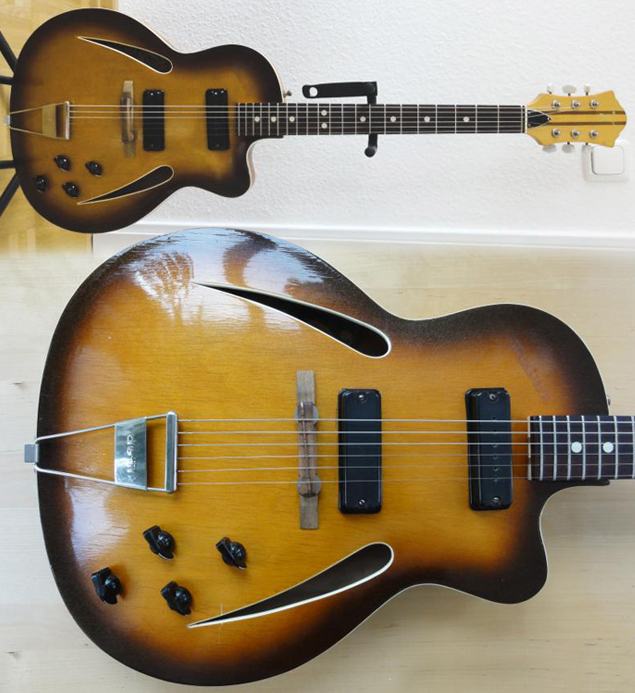 Like many instrument of this vintage Polish company, the Defil Malwa is a strange mix of elegance and crudeness: it has a subtle outline and Framus-like cats-eyes sound holes always look cool, but the gear and the finish feel rough - though the knobs and trapeze stoptail are without doubt replacements parts. These guitars have often bad reputation but I heard some demos on YouTube that are not that bad. BTW, did you know that Defil stands for Dolnoslaska Fabryka Instrumentow Lutniczych (Instruments Factory of Lower Silesia)? And that Malwa refers to a plant genus that includes hollyhocks - those tall and beautiful flowers that grow all over Amsterdam in summer when girls are shortly dressed, air is perfumed with suave cannabis fragrance and life is light - and mallows - with which marshmallows are made? © 2011, Guitarz - The Original Guitar Blog - now in its 10th year! Last call for Guitarz 2012 calendars ... BUY NOW!